^ 小西友七、南出康世 (2001,2002). ジーニアス英和大辞典（第2版）「adamant」. 大修館書店. ISBN 978-4-4690-4158-3. ^ 松田徳一郎 (1999,2002). リーダーズ英和辞典（第2版）「adamant」. 研究社. ISBN 978-4-7674-1413-3. ^ a b Blank, V. et al. (1998年). “Ultrahard and superhard phases of fullerite C60: comparison with diamond on hardness and wear”. Diamond and Related Materials 7 (2–5): 427. doi:10.1016/S0925-9635(97)00232-X. http://www.nanoscan.info/wp-content/publications/article_03.pdf. ^ Irifune T, Kurio A, Sakamoto S, Inoue T, Sumiya H. (2003年). “Ultrahard polycrystalline diamond from graphite”. Nature 421 (6923): 599. doi:10.1038/421599b. PMID 12571587. ^ Telling, R. H.; C. J. Pickard, M. C. Payne, and J. E. Field (2000年). “Theoretical Strength and Cleavage of Diamond”. Physical Review Letters 84 (22): 5160–5163. Bibcode 2000PhRvL..84.5160T. doi:10.1103/PhysRevLett.84.5160. PMID 10990892. ^ a b c d e f g h i P. G. Read (1999). Gemmology (2nd ed., available on Google Books). Butterworth-Heinemann, Great Britain. pp. 52, 53, 275, 276. ISBN 0-7506-4411-7. ^ Pan, Zicheng; Sun, Hong; Zhang, Yi; and Chen, Changfeng (2009年). “Harder than Diamond: Superior Indentation Strength of Wurtzite BN and Lonsdaleite”. Physical Review Letters 102 (5): 055503. Bibcode 2009PhRvL.102e5503P. doi:10.1103/PhysRevLett.102.055503. PMID 19257519. Lay summary – Physorg.com (12-02-2009). ^ 古財佑介、有馬眞（横浜国立大学） (PDF). ﻿ケイ酸塩融体中でのダイヤモンド溶解とモルフォロジーの変化﻿ (Report). 国立情報学研究所 学協会情報発信サービス. http://wwwsoc.nii.ac.jp/jepsjmo/cd-rom/2001cd-rom/pdf/mm/mm-p004.pdf 2012年7月5日閲覧。. ^ R.G., J; Copperthwaite, R; Derry, T; Pratt, J (1989年). “A tensiometric study of Diamond(111) and(110) faces”. Journal of colloid and interface science 130 (2): 347–358. doi:10.1016/0021-9797(89)90114-8. ^ Harlow, G. E. (1998). 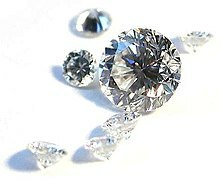 The nature of diamonds. Cambridge University Press. p. 223. ISBN 0521629357. ^ Weber, M. J. (2002). Handbook of optical materials. CRC Press. p. 119 (available on Google Books). ISBN 0849335124. ^ Field, J. E.; Freeman, C. J. (1981年). “Strength and Fracture Properties of Diamond”. Philosophical Magazine A (Taylor and Francis Ltd) 43 (3): 595–618. Bibcode 1981PMagA..43..595F. doi:10.1080/01418618108240397. ^ Moriyoshi, Y. et al. (1983年). “The microstructure of natural polycrystal diamond, carbonado and ballas”. Journal of Materials Science 18 (1): 217. Bibcode 1983JMatS..18..217M. doi:10.1007/BF00543828. ^ Iakoubovskii, K.; Adriaenssens, Guy J (2002年). “Comment on `Evidence for a Fe-related defect centre in diamond'”. Journal of Physics Condensed Matter 14 (21): 5459. Bibcode 2002JPCM...14.5459I. doi:10.1088/0953-8984/14/21/401. ^ Taylor, W.R., Lynton A.J. & Ridd, M. (1990年). “Nitrogen defect aggregation of some Australasian diamonds: Time-temperature constraints on the source regions of pipe and alluvial diamonds” (PDF). American Mineralogist 75: 1290–1310. http://www.minsocam.org/ammin/AM75/AM75_1290.pdf. ^ a b c d Walker, J. (1979年). “Optical absorption and luminescence in diamond”. Rep. Prog. Phys. 42 (10): 1605–1659. Bibcode 1979RPPh...42.1605W. doi:10.1088/0034-4885/42/10/001. ^ Hounsome, L. S. et al. (2006年). “Origin of brown coloration in diamond”. Phys. Rev. B 73 (12): 125203. Bibcode 2006PhRvB..73l5203H. doi:10.1103/PhysRevB.73.125203. ^ a b Iakoubovskii, K (2002年). “Optical characterization of natural Argyle diamonds”. Diamond and Related Materials 11 (1): 125. doi:10.1016/S0925-9635(01)00533-7. ^ a b c d e Webster, R. and Read, P. G. (2000). Gems: Their sources, descriptions and identification. Butterworth-Heinemann, Great Britain. ISBN 0-7506-1674-1. ^ Collins, A. T. et al. (2005年). “High-temperature annealing of optical centers in type-I diamond”. J. Appl. Phys. 97 (8): 083517. Bibcode 2005JAP....97h3517C. doi:10.1063/1.1866501. ^ Walter Schumann (3 November 2009). Gemstones of the World: Newly Revised & Expanded Fourth Edition. Sterling Publishing Company, Inc.. pp. 42–. ISBN 978-1-4027-6829-3. http://books.google.com/books?id=V9PqVxpxeiEC&pg=PA42 2011年12月31日閲覧。. ^ Eaton-Magaña, Sally et al. (2008年). “Using phosphorescence as a fingerprint for the Hope and other blue diamonds” (abstract). Geology (Geological Society of America) 36 (1): 83–6. doi:10.1130/G24170A.1. ^ Hanley, P. L.; Kiflawi, I. and Lang, A. R. (1977年). “On Topographically Identifiable Sources of Cathodoluminescence in Natural Diamonds”. Phil. Trans. Roy. Soc. A 284 (1324): 329. Bibcode 1977RSPTA.284..329H. doi:10.1098/rsta.1977.0012. ^ van Wyk, J. A. (1982年). “Carbon-12 hyperfine interaction of the unique carbon of the P2 (ESR) or N3 (optical) centre in diamond”. Journal of Physics C Solid State Physics 15 (27): L981. Bibcode 1982JPhC...15L.981V. doi:10.1088/0022-3719/15/27/007. ^ a b Davies, G. et al. (1976年). “The H3 (2.463 eV) Vibronic Band in Diamond: Uniaxial Stress Effects and the Breakdown of Mirror Symmetry”. Proc. Roy. Soc. A 351 (1665): 245. Bibcode 1976RSPSA.351..245D. doi:10.1098/rspa.1976.0140. ^ Freitas, J. A. et al. (1993年). “Observation of new vibronic luminescence band in semiconducting diamond”. Electronics Letters 29 (19): 1727. doi:10.1049/el:19931148. ^ Sa, E. S. De (1977年). “Uniaxial Stress Studies of the 2.498 eV (H4), 2.417 eV and 2.536 eV Vibronic Bands in Diamond”. Proc. Roy. Soc. A 357 (1689): 231. doi:10.1098/rspa.1977.0165. ^ a b O'Donoghue, M. and Joyner, L. (2003). Identification of gemstones. Butterworth-Heinemann, Great Britain. ISBN 0-7506-5512-7. ^ Koizumi, S.; Nebel, C. E. and Nesladek, M (2008). 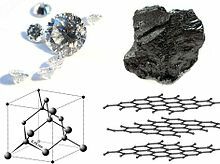 Physics and Applications of CVD Diamond. Wiley VCH. pp. 200–240. ISBN 3-527-40801-0. http://books.google.com/?id=pRFUZdHb688C. ^ Koizumi, S. et al. (2001年). “Ultraviolet Emission from a Diamond pn Junction”. Science 292 (5523): 1899. Bibcode 2001Sci...292.1899K. doi:10.1126/science.1060258. PMID 11397942. ^ Ekimov, E. et al. (2004年). “Superconductivity in diamond”. Nature 428 (6982): 542. arXiv:cond-mat/0404156. Bibcode 2004Natur.428..542E. doi:10.1038/nature02449. PMID 15057827. http://www.nims.go.jp/NFM/paper1/SuperconductingDiamond/01nature02449.pdf. ^ Takano, Y. et al. (2007年). “Superconducting properties of homoepitaxial CVD diamond”. Diam. Relat. Mater. 16 (4–7): 911. doi:10.1016/j.diamond.2007.01.027. ^ Takano, Y. (2006年). “Overview”. Sci. Technol. Adv. Mater. 7 (S1): S1. Bibcode 2006STAdM...7S...1T. doi:10.1016/j.stam.2006.06.003. ^ Anthony, T. R.; Banholzer, W. F.; Fleischer, J. F.; Wei, Lanhua; Kuo, P. K.; Thomas, R. L.; Pryor, R. W. (1989年12月27日). “Thermal conductivity of isotopically enriched 12C diamond”. Physical Review B 42 (2): 1104–1111. Bibcode 1990PhRvB..42.1104A. doi:10.1103/PhysRevB.42.1104. ^ a b Wei, Lanhua; Kuo, P. K.; Thomas, R. L.; Anthony, T. R.; Banholzer, W. F. (1993年). “Thermal conductivity of isotopically modified single crystal diamond”. Physical Review Letters 70 (24): 3764–3767. Bibcode 1993PhRvL..70.3764W. doi:10.1103/PhysRevLett.70.3764. PMID 10053956. ^ John, P (2002年). 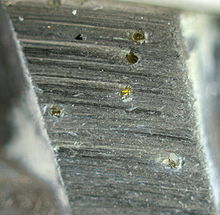 “The oxidation of (100) textured diamond”. Diamond and Related Materials 11 (3–6): 861. doi:10.1016/S0925-9635(01)00673-2. ^ Davies, G. and Evans, T. (1972年). “Graphitization of Diamond at Zero Pressure and at a High Pressure”. Proceedings of the Royal Society a Mathematical Physical and Engineering Sciences 328 (1574): 413. Bibcode 1972RSPSA.328..413D. doi:10.1098/rspa.1972.0086. ^ Evans, T.; James, P. F. (1964年). “A Study of the Transformation of Diamond to Graphite”. Proc. Roy. Soc. A 277 (1369): 260. Bibcode 1964RSPSA.277..260E. doi:10.1098/rspa.1964.0020. ^ Evans, T; Maguire, J; Maguire, J (1981年). “The stages of nitrogen aggregation in diamond”. Journal of Physics C Solid State Physics 14 (12): L379. Bibcode 1981JPhC...14L.379E. doi:10.1088/0022-3719/14/12/005. ^ Shatskiy, A. et al. (2009年). “Boron-doped diamond heater and its application to large-volume, high-pressure, and high-temperature experiments”. Rev. Sci. Instrum. 80 (2): 023907. Bibcode 2009RScI...80b3907S. doi:10.1063/1.3084209. PMID 19256662.